Our teams arrive at farms as early as possible towing trailers with custom made tarpaulins to protect the hens from adverse weather conditions. We work in small teams, each person specialising in a role: some take the birds out of their cages handing them to the ‘runners’ who carry the hens down the corridor to the ‘packers’ who then place the birds gently in the crates. We work swiftly to minimise the time they spend in the crates, but take time to pull aside the occasional hen which requires examination back at base, our ‘poorlies’ as we call them. Once the hens arrive at base (often the Co-ordinator’s home), they are unloaded and get to stand on solid ground. There’s something special about seeing hens look around them for the very first time – there’s no roof, just sky – no wire, just ground to scratch; space to stretch and flap, freedom to take a few tentative steps forward. It doesn’t take many minutes for instincts to return, wings to spread and absorb the sunshine, beaks to discover the joys of drinking great gulps of water! 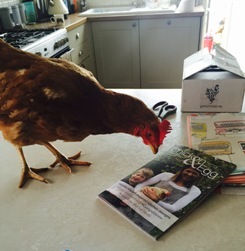 We never knowingly re-home a poorly hen and retain any unsuitable for adoption. The majority are suitable for re-homing and, after a rest and a toenail manicure (some birds come out with very long nails due to standing on wire), the adoption process begins and a steady stream of caring re-homers arrive to adopt these little ‘fortunates’ who have escaped the trip to the pie factory. We re-home the girls on the day they come out of their cages; there are two reasons for this. Firstly it allows them to settle into their new permanent homes as soon as possible. Secondly, and more importantly, each hen that leaves for her new life is a wonderful ambassador for those we leave behind. No amount of words is as effective as watching the hens’ bewilderment turn into wonderment at their new turn of fate. Anyone who has taken ex-bats will agree and know this is the best ‘education’ of all. As the re-homers arrive to collect their hens, last minute checks are made to ensure they will be transported safely to their new homes and demonstrations on how to handle them offered to first-time keepers. Details of re-homers are retained to provide full traceability in the event of an outbreak of a notifiable disease and once the birds have left to start their new lives, the Co-ordinator will thoroughly disinfect the transportation equipment. 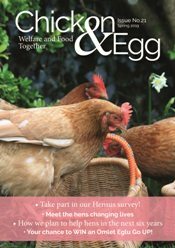 At the end of a successful hen collection day, a happy, tired team is one that has saved many lives and seen the hens on their way to a free range retirement. If you are inspired to volunteer take a look at our Current Volunteer Vacancies.